"1.1 mile loop with 120', stair-step climb from York to East Broad and a final short rolling hill along East Broad. Speeds of 50 mph+ are reached down Broad St. through town." After an inadequate warm up, I took the advice of the guys and sacrificed a pre lap to get a good start position. I was nervous about the bottom turns so I started towards the outside. The race started and Sayers immediately went to the front with a good chunk of Folsom guys - Bryant, Walker, Boynton and others. The first time up the climb was fast, in fact, according to Strava, it was the fastest time up the hill for the whole race. I spent the first few laps trying to survive the initial punch that's common in crits. I gradually learned the climb and found where I could make up ground with less effort. I would focus on the last few pedal strokes at the top of each "step" to maintain speed going into the flatter parts. I generally sat around 10th to 15th wheel with Bromstead holding it down closer to the front. It seemed the prevailing strategy from the 35's was to wait for Dirk to attack and then go with him. He would generally attack after the last stair step and before the roller with the hose. At one point, he went and a Thirsty Bear rider followed. I bridged up and we had a small gap. But the nature of the course meant there wasn't much cohesion in the break with no one really wanting to do much work on the only section where it mattered, over the top and into the wind. Not sure how long we stayed "away" (about 5-10sec.) but probably only a lap or two. I think this is where I earned a prime - $25 which was immediately spent on post race ice cream. We came back together and there were more attacks - Folsom, Sayers, Dirk, etc. It became clear to me that I needed the top to recover so being aggressive wasn't an option, at least at that point in the race. About 1/3 of the way in, Dirk and a couple others got off the front a bit and as I came around turn two, they were sliding into the hay. I locked up the rear brake and pulled off a sweet two wheel drift for a sec, before going inside the crash. A couple laps later, Walker (Folsom) went off the front with another guy and and same result. I came around turn 2 to see him on the deck. Dapice and a couple others got through first and hit the gas hard and there was a large gap to make up. Sequence captured here. Nice save by Andres! So after the two strongest attacks both ended on ground, the field seemed to tame a bit. I was starting to feel the repeated climbs in my legs and was not stoked when I looked down at my Garmin and saw the race was only 1/2 over. But I was confident that if I was feeling it, then the others were as well. I decided to not burn any more matches unless absolutely necessary and try to ride this course as smoothly as possible, staying towards the front. The clock could not go fast enough. Minutes 25 to 35 seemed to last forever but the lack of attacks kept the pace steady, which allowed me to find some rhythm. As riders got dropped or crashed out, the field had whittled to 10 or 15 riders and we still had three - Scott, Jacob and myself. If they were suffering, you certainly couldn't tell from their faces. Scott was always near the front and Jacob was there to remind me to not drift too far back. The first time I noticed the lap count, there were 7 laps left. 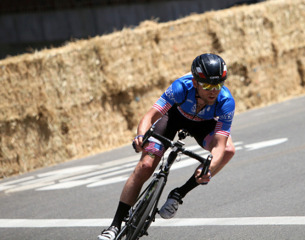 A Folsom MTB team rider (found out later he's a pro MTBer for Giant) went to the front and stayed there. Gil was on his wheel and I on his. Surprisingly, it stayed this way for the next 4 laps. I'm not sure what was happening behind for this part of the race but based on the pics, it looks, like the group had whittled to 7 or 8, with Scott and Jacob sill there, and MTB dude kept the pace high enough that none of the chasers made it back on. Somewhere on the third to last lap, Dapice put in an attack going into "hose hill" and I went with him. We had a small gap but couldn't hold off the Folsom chasers. My memory is pretty fuzzy here as we're about 45 min into a race where my avg HR was 178 - not much O2 going to the brain. I think Dapice put in another attack on the second to last lap and I followed as well, the group was right on us going into the downhill. I was on the front going into the bell lap. My thought at that point was get through the turns first to ensure staying upright and not having to close any gaps coming out of turn two (a predicament I found myself in through out the race). At the start of the last time up the climb, I felt I had the power to get away from guys at the top of the hill but I was worried I couldn't sustain it all the way over the top. From the "hose guy" to the start of the downhill seemed really long and had another roller in it. I decided to keep the pace high up the hill, trying to string it out and prevent an attack. At the top of the last steep part, Andres came around me on the outside with good speed, much more than I was anticipating. He put in a strong dig going into Hose Hill. I was immediately out of the saddle and chasing He had about a 20 meter gap. We made the left at the top and I looked back and saw a decent gap to the next guy. I did what I could to close the gap but I don't think it changed much. With my HR at 190 and the pain that comes with that, I wonder if the gap behind me gave me some comfort and I "settled" to try and hold 2nd rather than go deeper to try to catch Andres. But looking at my numbers, I was pushing pretty hard. On the final downhill, my vision was blurry but I saw Andres raise his arms and I felt a charging rider coming from behind. I put my head down and went as hard as I could, holding him off for second. Turns out he was the winner of the 45+ race so it wouldn't have mattered anyway. Bromstead was right behind him holding off Dapice for 3rd in the 35+ race and Jacob finished with the final group, 7th or 8th. All around strong effort from the team and it was such a great way to spend Father's Day, especially sharing the podium with Scott. In retrospect, if I was a little further back on the last lap, I may have been able to anticipate Andres' attack and I think I had the legs to go with him. But I'm already stoked to go for the W next year. Thanks guys for being such an awesome group.